Leftovers for lunch. Nothing like it. Last night I made an Asian green bean salad to have with some chicken and there were a few morsels left to be saved overnight in the fridge. 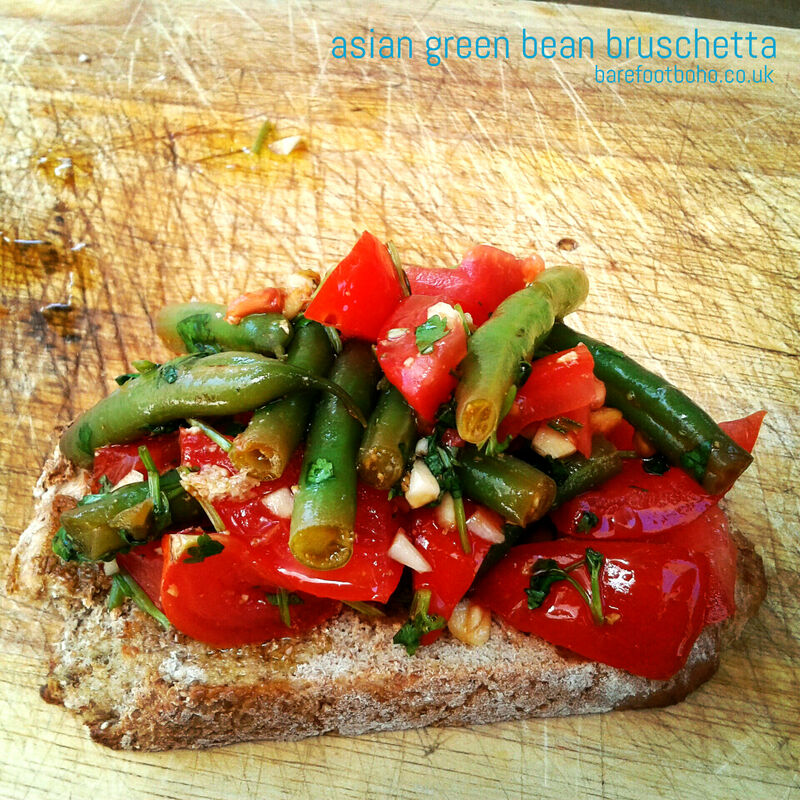 Today I toasted a slice of homemade nutty wholemeal bread and topped it with the salad and a drizzle of olive oil. The garlic and ginger had infused and gave the chilled topping a real punch. Oh divine! Best left in the fridge overnight for the garlic, ginger and chilli to really infuse. yet effective. A lot of times it’s very hard to get that “perfect balance” between superb usability and visual appearance. I must say you have done a great job with this. In addition, the blog loads very quick for me on Opera. Outstanding Blog! Sorry for the late reply, I’ve been away from the blog too long. Thanks so much for your feedback. It’s great encouragement and has given me a boot up the backside to pick it up again. Lena, I hope you enjoyed your Asian fix while your clan were away! This is what I will be making tonight. My hubby is away with kids and I can have this all to my lovely self. My taste buds are going insane! SOY SAUCE, FISH SAUCE, and SUGAR is definitely up my ally! Glad you like it Lena. It’s perfect self-indulgent loveliness! Hi there, really sorry for the late reply! I’ve tested on all browsers and all seems to be working well. I purposely chose a simple clean design so my blog focus would be on usability. My advice is to always keep things clean, lots of white space, clear navigation and signposting and constantly think about the user and who they’ll be browsing. The more complicated the functionality the more room for error. I’m generalising but I try and adopt the Apple approach… keep it simple… and you can’t go wrong.